CAMBRIDGE, Mass. -- Last August, Hurricane Irene spun through the Caribbean and parts of the eastern United States, leaving widespread wreckage in its wake. The Category 3 storm whipped up water levels, generating storm surges that swept over seawalls and flooded seaside and inland communities. 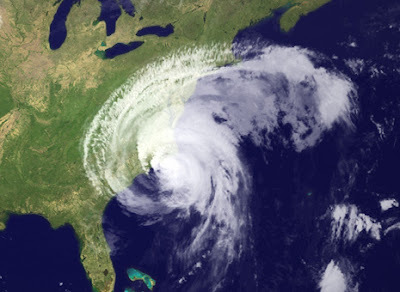 Many hurricane analysts suggested, based on the wide extent of flooding, that Irene was a “100-year event”: a storm that only comes around once in a century. However, researchers from MIT and Princeton University have found that with climate change, such storms could make landfall far more frequently, causing powerful, devastating storm surges every three to 20 years. The group simulated tens of thousands of storms under different climate conditions, finding that today’s “500-year floods” could, with climate change, occur once every 25 to 240 years. The researchers published their results in the current issue of Nature Climate Change. MIT postdoc Ning Lin, lead author of the study, says knowing the frequency of storm surges may help urban and coastal planners design seawalls and other protective structures. Lin collaborated with Kerry Emanuel, the Cecil and Ida Green Professor of Atmospheric Science at MIT, as well as with Michael Oppenheimer and Erik Vanmarcke at Princeton. The group looked at the impact of climate change on storm surges, using New York City as a case study. To simulate present and future storm activity in the region, the researchers combined four climate models with a specific hurricane model. The combined models generated 45,000 synthetic storms within a 200-kilometer radius of Battery Park, at the southern tip of Manhattan. They studied each climate model under two scenarios: a “current climate” condition representing 1981 to 2000 and a “future climate” condition reflecting the years 2081 to 2100, a prediction based on the Intergovernmental Panel on Climate Change’s projections of future moderate carbon dioxide output. While there was some variability among the models, the team generally found that the frequency of intense storms would increase due to climate change. Once they simulated storms in the region, the researchers then simulated the resulting storm surges using three different models, including one used by the National Hurricane Center (NHC). In the days or hours before a hurricane hits land, the NHC uses a storm-surge model to predict the risk and extent of flooding from the impending storm. Such models, however, have not been used to evaluate multiple simulated storms under a scenario of climate change. Again, the group compared results from multiple models: one from the NHC which simulates storm surges quickly, though coarsely; another model that generates more accurate storm surges, though less efficiently; and a model in between, developed by Lin and her colleagues, that estimates relatively accurate surge floods, relatively quickly. Today, a “100-year storm” means a surge flood of about two meters, on average, in New York. Roughly every 500 years, the region experiences towering, three-meter-high surge floods. Both scenarios, Lin notes, would easily top Manhattan’s seawalls, which stand 1.5 meters high. But with added greenhouse gas emissions, the models found that a two-meter surge flood would instead occur once every three to 20 years; a three-meter flood would occur every 25 to 240 years.